Over 200 people came to our two summer concerts in May and June at St Giles' Church, Great Maplestead, in aid of Rotary Club of Halstead Charities, and at St Andrew's Church Halstead, in aid of St Andrew's and St Catherine's, Gosfield church funds. The concert featured a wide selection of music including choral works by Haydn, modern arrangements by John Rutter, traditional sea songs, film music, and even the Coldplay number “A Sky Full of Stars” The concert theme of land, sea and air was reflected by poems, an organ version of Sir Henry Wood's Fantasia on British Sea Songs, performed by our Musical Director Alexander Binns and a violin solo by Dora Chatzigeorgiou. 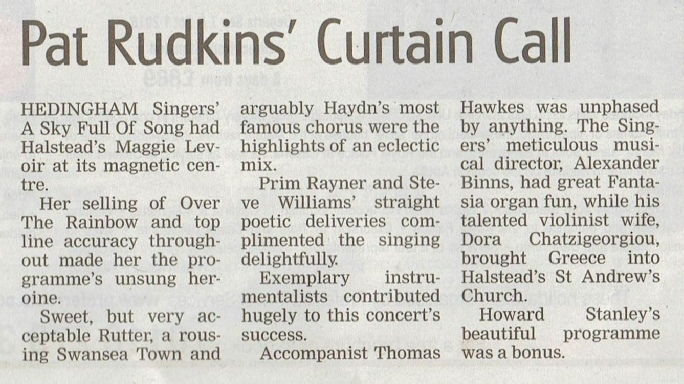 Amongst the audience was Halstead Gazette's Music and Theatre Critic, Pat Rudkins, who posted the following review. Dates have been announced for four concerts featuring The Hedingham Singers in 2019. Continuing our long association with Halstead Rotary we will be presenting an Anniversary Concert on Saturday 25th May at St Andrew's Church, Earls Colne. For the first time, we shall be joining with Braintree Male Voice Choir for a combined concert on Saturday 29th June at the Empire Theatre, Halstead. Finally, our popular “Concert for Christmas” takes to the road again, with a performance on Sunday 15th December at St Peter's Church, Sible Hedingham, and on Saturday 21st December at St Andrew's Church, Halstead. All dates are provisional and concert details may be subject to change so for the latest updates and further information regularly check our web site. St Peter's Church, Sible Hedingham was full to capacity on the night of Saturday 10th November as local people and members of local organisations joined with The Hedingham Singers to commemorate the signing of the Armistice 100 years ago. Led by Musical Director Aleander Binns, and accompanied by Thomas Hawkes, the first half of the concert featured songs that the soldiers of the first world war used to sing, including “Pack Up Your Troubles”, “Daisy Bell” and “Good-Bye-Ee”. After the interval the audience joined with the choir in an act of remembrance which included music by Hubert Parry, Howard Goodall and Edward Elgar. Soloist Tudor Weyers, a chorister at St Edmundsbury Cathedral, Bury St Edmunds performed Faure's “Pie Jesu” and the first verse of “The Lord Is My Shepherd”. A two minute silence was preceded by The Last Post and ended with Reveille, both played on the cornet by Ted Hawkes. Amongst the music were poems written by four famous “war poets”; “The Soldier”, by Rupert Brooke, ready by Sam Heather, 1st Castle Hedingham Scouts, “Dulce et Decorum Est” by Wilfred Owen, read by Steve Williams, “In Flanders Fields” read by Maggie Parmenter and “For The Fallen” read by Maggie Levoir – all members of The Singers. A visual presentation featuring images of the First World War was produced by Peter Earey, and with contributions from The Royal British Legion, Hedinghams Branch, and 1st Castle Hedingham Scouts, made the occasion a fitting tribute to those who gave their lives for our country, ensuring that WE WILL REMEMBER THEM. December has been a busy month for The Hedingham Singers with two performances of our popular Concert for Christmas, first at St Andrew's Church, Earls Colne, followed a week later by a second performance at St Nicholas' Church, Castle Hedingham. The church at Castle Hedingham was packed full of concert goers who enjoyed an evening of carols from around the world, including one sung in Greek, and joining in with some of the more traditional carols, and participating in a rousing version of “The Twelve Days of Christmas” Unfortunately, the audience at Earls Colne was not as big as usual, but that did not stop the singers putting on a great performance, as noted by Pat Rudkin, in her “Curtain Call” review in the Halstead Gazette. A Concert for Christmas was beautifully arranged by The Hedingham Singers and was worthy of a much bigger audience at St Andrew's Church, Earls Colne. Some members of the choir also took part in this year's Castle Hedingham Advent Calendar festivities, in which a different window in the village is opened every day to reval a Christmas scene. When the window at the village Community Shop was opened, it revealed our singers, dressed appropriately as Victorian style carol singers. 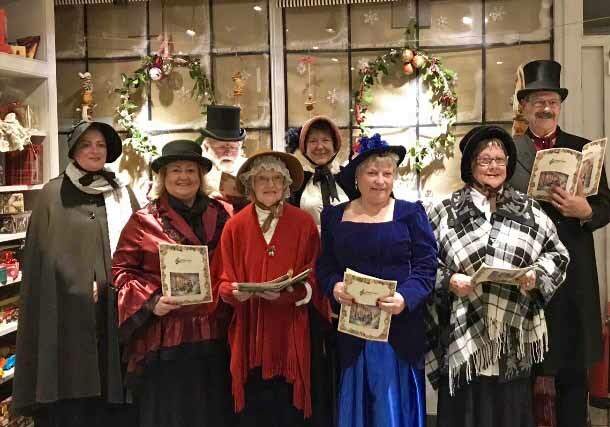 Following the unveiling, our singers dropped in the local hostelry for some warming liquid refreshment and ended up performing an impromptu concert of popular carols. Due to circumstances beyond our control the Halstead Rotary Celebration Concert scheduled to be held on the 25th May at St Andrews Church, Earls Colne has had to be postponed until the Autumn. However The Hedingham Singers will now be presenting a concert of songs from the movies on the same date, but at St Nicholas' Church, Castle Hedingham, where we hope literally to raise the roof with our singing as we will be helping The Friends of St Nicholas Church to raise funds to keep the church standing. Full details will shortly appear on our Concerts page. It is going to be all change at The Hedingham Singers, as we sadly say goodbye to our present Musical Director, Alexander Binns. Alex joined us in September 2017, having picked up the baton from Thomas Duchan, and expecting to be our MD for some years as he had just been appointed Assistant Director of Music at St Edmundsbury Cathedral, Bury St Edmunds, and had moved to the town, with his then partner, now his wife, Dora. However, at the beginning of this year, Alex was appointed Director of Music at Derby Cathedral and will be moving to the city with his wife and baby son, Paul in April. Fortunately the music will not be stopping as Thomas Duchan will be rejoining us as Alex leaves, resuming his role as Musical Director. Thomas brings with him a wealth of experience and will immediately continue with the rehearsals for our concert at the end of May, plus start planning the programme for the rescheduled Halstead Rotary Concert in September (see below) plus our popular annual Concert for Christmas in December. We wish Alexander every success in his new role and thank him for leading the Singers over the past 17 months, and warmly welcome back Thomas.